I'm delighted to announce this is my first photo-shoot that I styled and pieced together. I've always wanted to try the blue and emerald green combination. 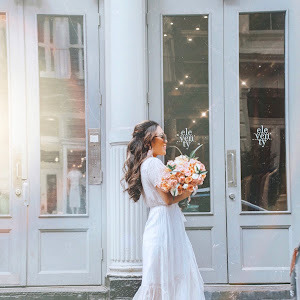 I always come across a combination on Pinterest, whether it's fashion bloggers, celebrities, home decorations, or even cake, and I'm so pleased with how this shoot turned out. I am in love with this Layer Me pearl necklace I bought a while back from Hello Fab and just had to accessorize it on Madison. It was a blast, even though it was freezing early that morning, and I had fun working behind the camera. Afterwards, we went for a nice, hot, refreshing cup of coffee at a local coffee shop downtown. P.S. My good friend Madison is only a sophomore in high school (6 ft tall) and yet she towers me. How do you wear the Pantone Color of the Year?